It's that time of year when clocks everywhere are set an hour ahead while our bodies wonder what on earth is going on. It seems so illogical. I admire our Saskatchewan province for sticking to their guns and not going along with it for all these years. There's more leaping ahead going on in the garden. Our cold spell lifted slightly and in response, all sorts of things are showing life. Rhubarb unfurls wrinkled leaves, cherry tree buds cluster tightly on branch ends, blueberries look like they might flower, and when I peeked under the cover of the lemon tree, I saw a few buds there, as well. Bring it on, I say! On a recent walk along the water, a raucous crow had me turn my attention to the trees, and I caught the object of the crow caws, a Great Blue Heron, perched not too far above me. Branches were in the way of good photos, so I asked Tim to take a few shots from his taller vantage point. I think herons look like grumpy old men all hunched up, mad at the world, and not afraid to let everyone know it. As the crow continued screeching at the heron, the Great Blue stood up, opened his wings, and his beak and looked very menacing. It didn't seem to bother the crow and soon the Great Blue settled down into his hunched up pose again. Moss is pretty, I think. Moss is a nuisance, Tim thinks. While he plots against it, I'm happy to photograph its intricacies. I don't think its going anywhere anytime soon. 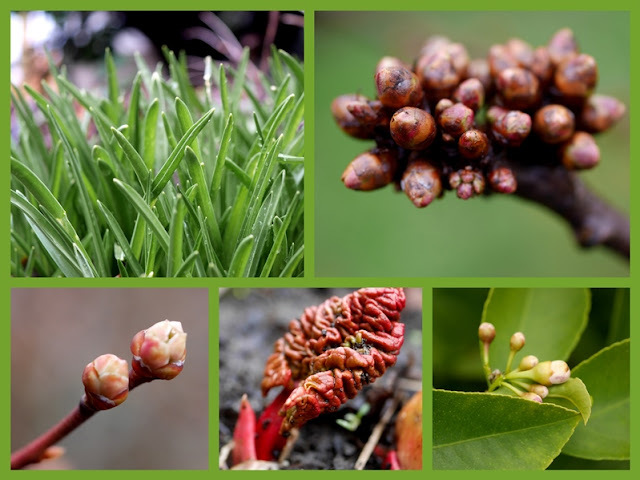 Are you seeing signs of spring? Or is it all over already? Lorrie, I had to laugh at the heron. He does look like a grumpy old man! Happy Sunday evening to you! Still seeking! Wonderful photos Lorrie! Your mosaics are lovely, Lorrie. I think moss is pretty, too. Yes, we have many signs of spring all around us here, but we're having a cold snap right now. Parts of our state got snow last night. Hope you have a great week, Lorrie! These were great photos. Thank you for sharing them. I know lots of people complain about the effects of the time change but I have lived with it all my life and can't complain about any impact I've noticed personally. They do look like cranky old men with beetled brows and everything. Ha! Signs of spring? Not in the past ten days and the next while doesn't look too promising either. I did like having sunlight at 6:30 this evening. We are so happy when we get to see the elusive Blue Herons at the lake from a good standpoint. As we were absent for so long they seemed to have gotten used to the lack of activity on our beach and in the shallow waters with the many minnows! You have some great shots here! Spring is a long way off for us...it's snowing right now! Great photo of the heron. The time change thing really is very strange. Interesting that Saskatchewan doesn't follow the tradition. We never change clocks here. I find it so weird that Sri Lanka, India are 2-1/2 hours ahead of us. Where does that half hour come from. :) Your husband should rethink his plotting ways, as moss has many environmental benefits. One hour time change doesn't bother me, not even two, it starts when it comes to 4 h difference ! This bird looks funny, I have never seen one like that ! Spring is springing here too. Everywhere I look there are new things appearing. So hopeful! Love the shot of the heron with his wonderful mantle of shaggy feathers. He does look rather grumpy, but I think it's difficult for them to smile ;) I used to listen for the crows in my parents' woods, as that would usually mean they were pestering the great horned owl. Made it easy to find the owl. Have a great week! They're calling for heavy snow here starting today, but building up worse tomorrow. I thought we were done. I am smiling at your description of the herons. Ha, now that you mention it I do see that resemblance. Tim got a great shot from his vantage point. 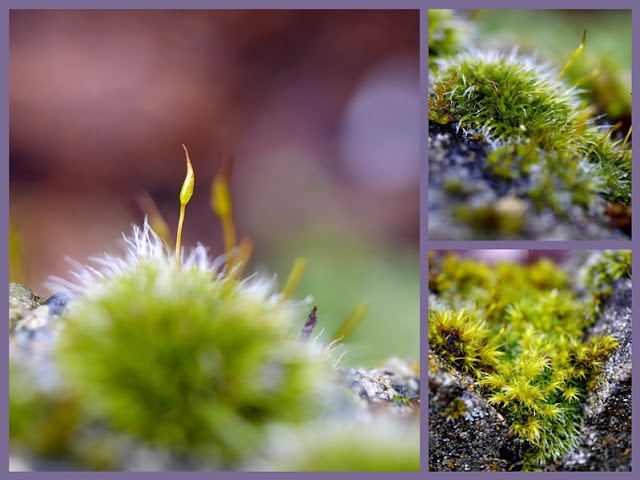 Your mossy shots are so pretty. I'm currently looking at my cherry tree in full bloom with a slight sprinkling of snow still hanging around at the base. Spring is out there. You're so right about the description of the heron, Lorrie, and what great photos, too. I love how your area doesn't change the clocks. How wonderful to not do that! In your previous post, I so admired your beautiful quilt squares. How pretty that quilt s going to look on a twin bed, and I look forward to seeing the finished project. May you have a happy week, Lorrie! The time change seems harder when you lose an hour like on this weekend. And its so dark in the mornings. I wonder if it will ever change. I've heard more complaining this year than I ever remember! Wonderful photos this morning! Man versus moss, that's a battle Tim is sure to lose methinks. The Great Blue Heron is a real character, a GOM (grumpy old man) if ever I saw one. 26th March is when we put the clocks forward in France but the days are starting and ending earlier already. We have blossom on the forsythia and more daffodils than I can count. I love spring! Beautiful photos. I love how the crows tell me something interesting is hanging around. Snowfall here. No Spring yet! We did see moss on our walk last week and I love it too! Your title had me smiling. I could identify! You got some great shots despite the un-springlike weather. My camera is lying here waiting for some spring inspiration. And waiting some more. I have never met a soul who likes the time change. Love your photos. We have some grumpy herons here too! I didn't know about Saskatchewan - good for them! Arizona is our state to look up to for wisdom of this kind. Sigh. You are right about the heron looking like a grumpy old man! I love these shots your husband got of this one. Thank you for all your glimpses of spring bursting forth or dragging in...however it comes, it will come and shall come, because God ordered the seasons this way. They certainly give us a lot to enjoy and talk about! The fresh green of the moss is lovely and shouts Spring to me! I'm with you and like plants appearing in little nooks and crannies. I don't trust my husband using a hand sprayer any more - too many 'oopsies'! You've summed up Mr Blue Heron perfectly - he would rather not have visitors encroaching on his domain - be they man, bird or beast! He is a magnificent bird. Cool heron shot! Your "grumpy old man" description cracked me up. We're currently under a winter storm warning and could receive up to 30 cm of snow by tomorrow evening. March madness, indeed! We are going to get a huge storm tonight into tomorrow, so no spring here! We've been tricked by our mild winter! Lovely shots of what's going on there...so much detail in that crow! Here we were having spring far too early for our climate in Southwestern PA. but gusty winds and swirling snow have returned. The heron looks cold in the first photo, Lorrie. Or at least he looks the way I look when I am cold--I hunch over and put on a heavy sweater ...smile. I don't mind daylight savings time as I enjoy the longer daylight it gives us in the afternoon, early evening, but my daughter dislikes it as she finds it harder to get up for work in the dark morning hours. A few places in the United States does not observe it wither. Our weather has been unusually warm all winter. We are very dry here and need some snow or rain soon, whcih I hope spring weather will bring! I also am enjoying signs of spring. Love the moss, but wish it wasn't on our roof. The daffodils have begun blooming. Way toooooooo much rain. Not sure I like the time change, I certainly didn't think it was time to do that yet. The heron is just plain wonderful! They do look like grumpy old men! I must show your picture to my husband some morning before he's had his coffee! I should move to Saskatchewan! Or Arizona. But I'm retired now so I pretty much ignore DST and ease into it gradually. I love moss! Used to have about an acre of it at our old place, far in the back by the waterfall and it was magical walking on it. A perfect description of your wonderful Mr. Heron. It was deep winter all last week, but today the sun shines and puddles are forming as snow melts. I still grumble about clock changes, although it makes no never mind in this household at this stage of our two lives. So glad you've got Spring poking out everywhere these day. Lovely mosaic, and I agree moss can be quite wonderful. We may see spring by next month, I'm looking forward to seeing buds like yours. Even moss, I let it be and sometimes move chunks around to grow on rocks and things. I like your description of a blue heron - spot on! I like moss, but I'm not a gardener, so my opinion doesn't count! Beautiful pictures. I like DST, but would just as soon stay on it all year. (I do like the longer evenings and being old and retired I can sleep until light wakes me if I want to. Except when I can't, but time has nothing to do with that.) Arizona doesn't go on Daylight time... we have family there and have to remember to readjust our time difference when we call them.